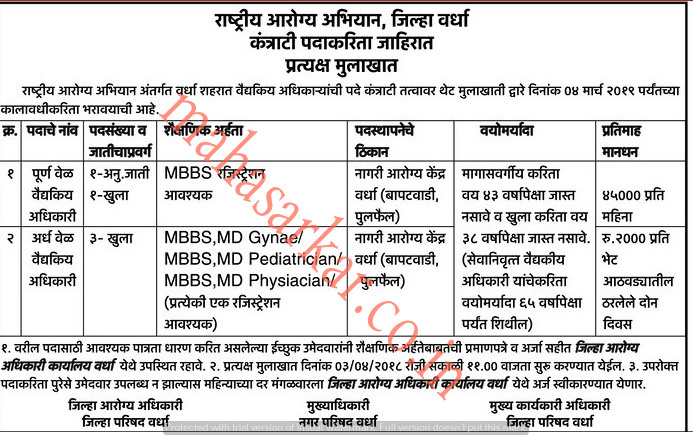 Rashtriya Arogya Abhiyan Wardha (National Health Mission Wardha),Wardha Published Job Notification for 05 Medical Officer Posts. Candidates who wish to apply must look at Rashtriya Arogya Abhiyan Wardha Medical Officer Recruitment 2018. Eligible candidates can join Walk-in Interview on 03-04-2018. Education Qualification: MBBS/MD and More. For Post wise Education Details follow the detailed advertisement. Interested & Eligible candidates may attend for walk in interview along with all the documents addressed at District Surgeon Wardha. Starting Date, Last Date to Apply Offline at National Health Mission Wardha which candidates should be remembers as follows. 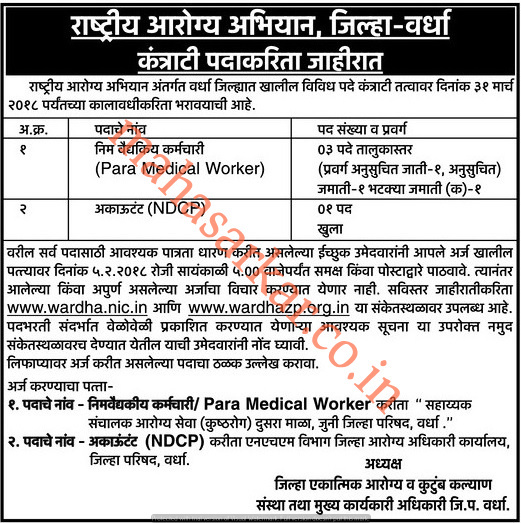 Rashtriya Arogya Abhiyan Wardha (National Health Mission Wardha), Wardha Published Job Notification for 04 Para Medical Worker & Accountant (NDCP) Posts. Candidates who wish to apply must look at Rashtriya Arogya Abhiyan Wardha Para Medical Worker & Accountant (NDCP) Recruitment 2018. Eligible candidates can apply offline before 05-02-2018. Interested & Eligible candidates can send their application along with all the necessary documents and testimonials to Given Address in Advertisement. Starting Date, Last Date to Apply offline at National Health Mission Wardha which candidates should be remember as follows. Start Date to Apply offline: 26-01-2018. Last Date to Apply offline: 05-02-2018.